The next piece of 3DPBMCSHMtm returns to Altorr and deals with the reaver giants of Jotunfell. Bards and faerie mock giantish slowness. Yet the warriors recall rocks smashing cavalry and shield-mates sundered by axes and do not laugh. When the reavers of Jotunfell march, nobody is safe. More than one lordling ignores the hillfolk then finds his steading smashed and his serfs enslaved. The mountain passes are feared with good cause. Jotunfell is a glacial mountain pass surrounded by hills. The Aerie of Jotunfell is a great castle commanding the pass. The Skugga family of cloud giants hold the castle, forming the linchpin of an alliance of giants. The Skugga banner is a black cloud on azure with two silver teardrops. The frost giants impale a cave bear skull on a longspear. The cyclops banner is a golden one-eyed ram skull with curved horns on black field. The hill giant standard is a great spear with three gilded dire wolf skulls pointing three different directions. Every equinox, the Skugga invite the leaders and retinue to Jotunfell to discuss events this season. Cautious acceptance is best recommended. The giants know not to offend the Skugga. Giants fall badly from great heights. The Skugga play favourites between hill giant and cyclops as the frost giants enjoy the show. Between such games of state, raids are plotted. Here the Skugga display tactical acumen and diplomatic skill in getting the giants to agree. Cyclops and hill giant clans violently contested claims to the hills around Jotunfell before the Demonplague. Now the clans work together with occasional violence. The ogre families who serve the hill giants enjoy opportunities for violence and torturing hill folk. Their glacial cousins have stranger habits still. Jotunfell hill giants are ravaging brutes that smash opponents with ogre and dire wolf allies. Hurled rocks soften up cavalry or spellcasters. As they advance they bellow dire threats to break the nerves of opponents and this often succeeds. Then they charge, intent on breaking the bones. Those taken as slaves are valued for their strength, either as disposable warriors or as labourers. While hill giants demand the slaves breed, few do. By contrast cyclops pick their battles. They take full advantage of terrain and weather. The large crossbow has versatility. Some bolts are tipped with black adder venom or dung. Cyclops snipers watch for spellcasters and single them out. If the foe are softened up, the greataxes come out. Few shield walls can withstand that. The cyclops delight in slavery, valuing each of their thralls, feuding when a slave is stolen. Both groups accept bribes from slavers or rogue merchants seeking audience and trade with the Skugga. Each group demands tolls independently of the other. The Skugga rein in the hill giants by making messy examples of ogre allies of theirs. Both groups salve their honour and the ogres get a reminder of who's really in charge. Frost giants dwell in the glacial crevasses of Jotunfell. Serdtsida Bluebeard wields boreal sorcery, leading the clan to reaving softer lands and slave taking. The great winter wolf Gyar is his companion. He is chieftain as the jarl was defeated in battle and carried off by the Skugga. Serdtsida uses magic to deceive or destroy foes. He thinks the jarl is dead and will brutalise any who suggest rescue attempts within earshot. The other giants are savage warriors. Serdtsida has grown brutal and alliance the Skugga has its rewards - this are good times. Even eating human tastes better.When reaving the lower hills, they are terrifying. They keep three ogres as scouts and spies among ogre allies of the hill giants. Though few, they are well fed and equipped. Relations with the cyclops, hill giants and ogres are cordial despite cannibalism and psychopathic shows of might. Nobody interferes with slavers visiting the frost giants. Though few, the frost giants are brutal enemies with poor impulse control and access to magic. 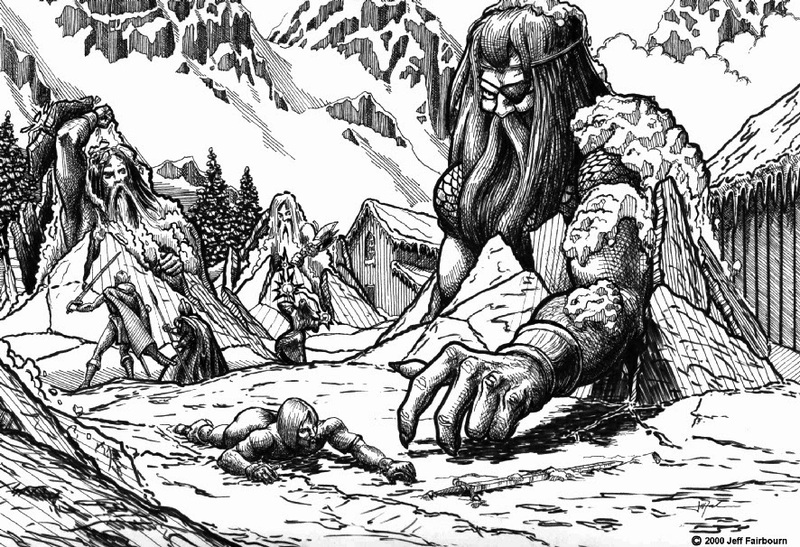 Even the wildest hill giant notices a trail of chewed bones and dismembered, half-eaten limbs. Kadjila, the slave-handler is the clan's smith and carefully trades slaves and steel with the Skugga. She hated the lecherous jarl, supporting Serdtsida staunchly. Those too weak to survive are eaten by the giants or given to the ogres as pets. Kadjila's forge is kept by three ogrekin. Each has a massive arm, stunted legs and enough smithcraft to make them very valuable. Dwelling in the Aerie is the Skugga, a family of cloud giants. Though only five in number, each has a personal attack griffon and numerous slaves in attendance. Peto, the family head is a brutal sorceror of Abyssal ancestry who plans to rule Altorr. His remaining family are ordinary cloud giants. Clad in finery, evil lives in their eyes and the cruelties they indulge upon their victims. The Skugga united the giants by tactical acumen and shows of raw power crushing their opponents. The Skugga view other giants in the alliance as allies rather than friends.Slavers make overtures to the Skugga with choice slaves, finery and treasures to warm the avaricious. The Skugga now hold a debased court. Their slaves indulge sadistic whims, terrified of being 'cast out' off walls or left for the harpies. Slaves are kept for cooking, cleaning and craft. The Skugga enjoy being pampered by a retinue while playing a harp or engaging in negotiations. The Skugga enjoy harpysong, numerous harpies nest in the towers, taking odd slaves as mate and food. The nests hold small altars to Pazuzu, a demon lord accepting tributes of bloody fresh tongues. Yet their filth conceals greater horror. The frost giant jarl lies chained, naked and used by the harpies who took his tongue. Others have come before him. The harpies still bring sacrifices who die faster.